Dumbing of Age is full of roommates who are foils, so I wanted at least one pair of roomies to be so similar that its bad for both of them. So meet the two social recluses, Amber and Dina. Here’s some folks who won’t be leaving their room very often. Amber will be faceplanting herself into WoW while Dina will be too busy obsessing about dinosaurs to chip away at her crippling social phobias. Aren’t they a fun, largely invisible pair. They enable each other. Never liked Dina much in “Walky,” but she’s darn cute lookin now! I’ve noticed that the “favorite” characters of the old stuff seem to be most often the ones that died in horrific and heroic ways. While those same characters were kinda assholes when they were alive. Ruth with being a violent drunk, and Dina with keeping Mike constantly drunk to the point of alcohol poisoning. Pffft. A simple handwave will point out that that was hardly damaging, what with the abductee powers. Besides. It was Mike. King Jerkass. Being finally put, somewhat, in his place. It was good for him. Probably. Damn you. I’d just gotten off the addiction. I think I liked Dina better in It’s Walky!, but I’ll give this Dina a chance. Amber’s probably a bit what I was like going into college (except none of my friends went to the same school as me). This Dina has had one line, how can you know if you like her yet or not? She’s been in a good number of scenes. Maybe Willis is just getting better at drawing body language, but this incarnation seems to be too painfully shy, the It’s Walky! Dina was seen at least trying to engage the world, my initial impression is that this one would run from it if she could. She may develop quickly and grow, but the impression I have of this series is that it’s not going to be as character growth-driven as the last, as they will forever be in their first year of college. I dunno. Both me and my roommate are antisocial nerds, and we get out of the room plenty of times. Actually, that’s a lie, we stay in our room, and the rest of our little nerd coven comes into our room to watch movies until there are enough people that it makes sense to move into the lounge downstairs. Still, the point is, they can still make friends! Though Amber seems to already have Ethan and Mike, and Dina will probably tag along. Will this Dina blow up too? I’m kind’ve expecting Dina to be a bit of a geek in the Dumbiverse, since she was quite good with computers in the Walkyverse. I can fully imagine Dina and Amber playing WoW right next to each other and only talking via the game. That is of course when Amber isn’t out being a vigilante as Spider-Car. Well, they might enable each other, but it’s also possible that each will see how similiar the other is to themselves and either a) try to help the other in not being like them out of concern or b) find themselves changing in order to show it can be done while not realized their changing themselves for the better. Of course, being an anti social nerd who collects Transformers and avoids reality as much as possible I don’t have much room to talk. You know, it’s funny, as someone new to the walkyverse (that’s what it’s called right?) to see all these people commenting about what characters were like in other… versions? 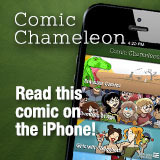 comics? whatever the socially acceptable thing to call them is? 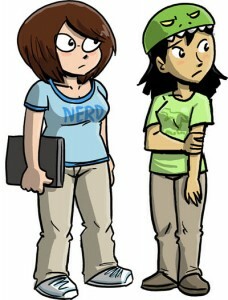 Yep, the Roomies!/It’s Walky!/Shortpacked!/Joyce and Walky comics are collectively the Walkyverse. And I can imagine being a newcomer is a tad odd when everyone else seems to know what to expect. Woah, that is totally my former roommate and me. So, the two women who are/were Mike Warner’s great love affairs in other Willlisverses are now rooming together? Okay. This will be interesting. For bonus points, they’re also the two centremost characters in the last update’s cast image. Coincidence? Okay, yes, it’s a coincidence. 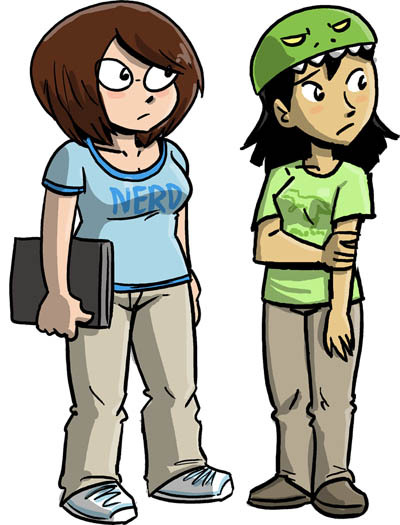 cuz the only thing hotter than hot lesbians, is nerdy lesbians! no, i demand it, not insist. Dina is not cute, she’s a doormat. She’s pathetic. We’ve yet to see evidence of doormatry. Good grief. Dina is Princess Jellyfish Dinosaur. after following it’s walky and then the myriad comics afterwards, i’m wondering what the artist has in mind for dumingofage. mr. willis doesn’t seem to be retconning, is this a new universe? the characters are similar, but are they supposed to be the same people, or just the archetypes that he had already developed? The basic premise is “What would the characters been like if all the zaney stuff in their lives didn’t happen, and they lived NORMAL lives?” None of the abductions happen, so anything they set off also didn’t happen.